The Line-Array is the modern deployment of a design first developed by Harry Olsen at RCA in the 1950s. The ubiquitous column loudspeaker cabinets of the late 1960s and early 1970s (WEM was one prominent UK brand) were an early elementary form of line-array. While these were abandoned by the music industry in the 1970s in favour of today's conventional point-source cabinets, they remained in use in churches and similar buildings for the whole of the intervening period, and are still commonly installed in houses of worship. The larger-scale line-arrays that are used today - the standard (almost the only) design employed in major festivals at the time of writing - did not appear until L'Acoustics pioneered their V-DOSC systems in the 1990s, but by 2010 even some low-budget loudspeaker manufacturers had begun to feature ranges described (if not always actually functioning) as ‘line-array’. Physically, it is a group of loudspeakers designed to be hung or stacked so that the closely-spaced drivers are arrayed in a line. Although horizontal line-arrays have been used in some (usually public speaking) applications, the line-array in modern PA systems is a vertical array of speakers, where each array is usually flown (hung) from a gantry or truss tower, although most designs also allow for cabinets to be stacked. There will usually be two arrays for standard stereo operation, although additional arrays or separate cabinets or clusters may be needed to fill the front-central and/or side sections of a wide audience area. Typically, the individual drivers and cabinets in a vertical line-array exhibit a very narrow vertical pattern, combined with a relatively wide (90° or more) horizontal pattern. Less unwanted audible side-effects (specifically, comb-filtering) than in other types of multi-cabinet system. From an audience or front-of-house sound-engineer's perspective, line-array systems give a greater sense of proximity (‘presence’), as though the sound source was much closer than it actually is. Conversely, a line-array loudspeaker system is generally less prominent as a focus for attention (the location of the array is a less noticeable element in the overall experience than it tends to be with conventional point-source systems). At the same time, performers and monitor engineers generally find that line-array systems are a less intrusive part of the on-stage sound than comparable point-source systems. Line-array design and the underlying acoustic theory is complex, and some of the theoretical advantages and proposed mechanisms of operation do not enjoy industry-wide consensus. Probably the most widely disseminated explanation of how line-arrays work is the ‘cylindrical wave’ model, which - in spite of its popularity - has more to do with marketing than with physics. In broad terms, line-array systems achieve improved acoustic performance through interference between individual drivers in the array. Some of the underlying principles of this are discussed in further detail in the section on Phase. Efficiency. Line-arrays are generally designed to keep driver separation within half a wavelength through a substantial proportion of their frequency range (i.e. to couple acoustically through an arc of forward positions). Where the output from two separate drivers is coupled, their combined output is 6dB greater than the output of an individual driver, and 3dB greater than two drivers that are not coupled. The line-array therefore exhibits greater efficiency (its acoustic output is 3dB greater) than multiple-loudspeaker arrays in which the individual drivers do not couple. Pattern Control. Pattern control is improved in both horizontal and vertical planes. As identical cabinets are aligned vertically, their combined horizontal pattern is the same as that of a single cabinet. This allows multiple cabinets to be used without affecting the horizontal pattern. Another positive product of interference in line-array systems - resulting from phase discrepancy between drivers in off-axis positions - is a narrowing of the output at the ends (top and bottom, in a vertical array) of the array. This effect increases as the length of the array increases. This is beneficial in live sound reinforcement, as output can be concentrated on the audience area, and kept away from other surfaces. Reduced Phase Effects. Phase differences arise where two cabinets producing the same signal are at different distances from the measuring or listening position (again, see the section on Phase). Where cabinets are arrayed side by side this will result in constantly changing phase relationships in the audience area (see Diagram 1, below). As well as creating an uneven frequency response across the auditorium, this usually results in audible comb-filtering (typically a high-frequency "ffff ffff" sound) as a listener moves across the audience area. Where cabinets are arrayed vertically, there is no phase difference across the audience area, and phase differences for equivalent movement between front and back of the audience area are far less (see Diagram 2, below). While there may still be some comb-filtering, the proximity of the drivers limits this to the highest frequencies, and because any effect is only found in the vertical plane the audible effect is effectively eliminated. Line-array systems therefore allow multiple drivers to achieve high overall output levels without the main adverse effects associated with conventional multiple-loudspeaker systems. There are, however, practical difficulties in implementing some of the design criteria. First, coupling requires close proximity between adjacent drivers. To couple efficiently, adjacent driver centres need to be closer than half a wavelength of the highest frequency in their range. Acoustic coupling is therefore relatively easy to achieve at lower frequencies, where audio wavelengths greatly exceed driver dimensions, and where relatively high off-axis angles have a limited effect on phase. However, while the use of smaller drivers can extend coupling into the midrange, the half-wavelength at 5 kHz is less than 3.5 cm, which is less than half the magnet diameter of a typical 1" driver. Clearly, then, a line-array system cannot easily achieve coupling at the highest audible frequencies. Second, directional control cannot be maintained over wavelengths greater than (or even nearing) the length of the array, so at lower frequencies - the wavelength at 40Hz is more than 8.5 metres - there is another barrier to the line-array's effective pattern control. Flown subs also lose 6dB through the removal of half-space loading, and the additional weight of low-frequency cabinets potentially compromises load capacity at the array's suspension point(s). An operational limit to using closely arrayed horns in this way is where the outward curvature of the wavefront at the horn exit (the distance denoted by the letter "a" in the diagram, below) exceeds one quarter of a wavelength of the highest frequency reproduced. At 10 kHz this is only 8.5 mm. This allows conventional horn-loaded compression drivers to cover the highest frequencies whilst minimising adverse interference effects. At the lower-end of the audio frequency spectrum most line-array manufacturers produce bass cabinets that can be incorporated in a flown array. These are usually positioned at the top of the array, as this reduces the load on cabinet suspension links. However, use of these in isolation does not generally provide satisfactory bass levels, and most line-arrays will use ground-located bass units (either as well as or instead of flown bass cabinets). For optimum control these will be arrayed in a horizontal line (the bass array arrangement shown in the section on Speaker Position is an example). Finally, the vertical pattern of a line-array is narrow by design. This acts in conjunction with further narrowing of the overall vertical pattern as the length of the array increases. As a result, covering an area where there is a large vertical angle between front and back audience positions may call for an array of impractical length (or require the array to be flown in an unsuitable location). A common solution is to increase the downward angle of the lower cabinets, forming a "J" array. Some manufacturers produce dedicated cabinets with a wider vertical pattern to cover the lower part of the array, although this practice is not universal. An alternative method is to use an array with a uniform curve (several manufacturers incorporate this in their design), which avoids the more complicated interference effects inherent in the J-array. You will certainly need to read the manufacturer's user guide, as mounting and controller configuration instructions will be system-specific. Most line-array systems are also provided with acoustic modelling software, and you are unlikely to achieve optimum performance without using it. It is often possible to load venue details from the software or loudspeaker producer's database, but you will need to enter information manually where details are not available. Based on venue and equipment details, the software will determine the number and type of cabinets required and preferred mounting or stacking locations, as well as controller/amplifier settings (including, where appropriate, gain settings for individual cabinets or cabinet groups). For flown systems you will also need suitable mounting hardware (which in turn will probably mean you need to employ a rigger). Flown systems are easier to install than stacked systems, as the line-array can be assembled one cabinet at a time at ground-level before being winched into position. Once the line-array is up and running, you can use it like any other loudspeaker system. For small provincial arts centres and village halls, definitely not (and don't even think about it for pubs). 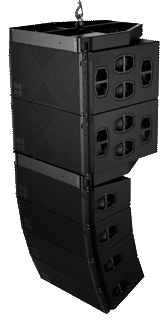 For large auditoriums and outdoor events with audiences of more than a few hundred, the line-array is an improvement on other types of multi-loudspeaker system, but good point-source systems are considerably cheaper, and still provide quite respectable performance for audiences of less than a couple of thousand. Line-arrays are designed to be flown, and while ground-stacking options are available from most manufacturers, the full benefits of a line-array system cannot be realised unless it is flown. If you are not also able or prepared to invest in suitable equipment for flying a line array system (truss, motorised hoists, and all that goes with a flown system), then investing in a line-array probably isn't a Good Idea. If you require a system primarily for auditoriums with a depth of more than 40 or 50 metres (or outdoor events of a similar or greater scale), however, you should certainly give it some serious thought. If your likely platform is moderately large but not vast (minor festivals, not Glastonbury, and large concert halls, not stadiums), you might want to look at some of the "mini" line-arrays that several of the major manufacturers offer. As well as good audio performance, look for ease of assembly, software you can understand, and extensive manufacturer support. It needs to be at least ‘water resistant’ if you are planning to use it outdoors. Don't expect to have much spare change after you have sold your house to buy it. It has not been scientifically demonstrated or accepted that combined point-source driver outputs can produce a cylindrical wave. Although some of the perceived and measurable effects of closely-spaced drivers have characteristics of cylindrical waves, detailed analysis shows that these effects come about through interference: closely-spaced multiple sound sources do not create a single wave, but multiple waves that in effect pass through each other. Output from a single driver radiates as if the driver was a point-source: the sound-waves travel outwards in a spherical pattern. Most cabinets with a single driver covering each frequency range (i.e. most typical "full-range" cabinets) exhibit the same property. This means that the expanding wavefront is spherical in form, so that the area over which the sound energy is spread (4휋r2) is proportional to the square of the distance (r) from the sound source (loudspeaker). The sound energy in any given area (energy ÷ area) is therefore inversely proportional to the square of the distance, so the effect is known as the inverse square law. This equates to a 6dB reduction in sound level - on any acoustic measure - for every doubling of distance from the sound source. Note that it is the outward curvature of the expanding wavefront in both vertical and horizontal planes that produces this effect (not how much or how little of the sphere's surface is included). The inverse square law applies regardless of the directional properties of the loudspeaker: the area of any fraction of the sphere's surface (e.g. the area within the dotted lines) is still proportional to the square of the radius (i.e. 1/n of the area = 4휋r2/n). Note, also, that this takes no account of absorption of sound energy by the air as sound travels through it: the loss is solely the result of wave expansion. If the outputs from vertically arrayed drivers were to act as a single source, the wavefront would be flattened in the vertical plane (it would no longer be a curve, but a straight line). This would mean that the shape of the expanding wavefront was cylindrical rather than spherical. As a result, the area over which the sound energy was spread (2휋rh) would be directly proportional to the distance from the sound source (array). This equates to a reduction of only 3dB in sound level for every doubling of distance. Note that this is a theoretical ideal, and even if all the underlying assumptions were correct the actual performance of a real-world array would inevitably exhibit higher than theoretical losses over distance. Note, also, that the cylindrical wave model has probably unfairly gained traction because in real-world situations listeners barely notice the true sound losses over distance of a suitably aligned array. If interference patterns can limit effective losses in a large space to around 3dB per doubling of distance over the first 50 metres, and the nearest audience position is 12 metres from the array, there will only be a 6dB drop from 12 to 50 metres. Assuming that at greater distances it acts as a point source, the total loss over the second 50 metres will also be only 6dB. A change in level of 1dB over 5-10 metres of movement would be almost imperceptible at walking pace.